As the holidays approached, and 2009 was coming to an end, it seemed as if sellers were trying to capitalize on the holiday buying mania. And some people could argue that it worked perfectly. Regardless of that issue, it gave M.U.S.C.L.E. buyers a lot of auctions to consider. It appears M.U.S.C.L.E. sellers have a bit of a holiday hangover, because buyers’ options are currently not nearly as exciting or plentiful. 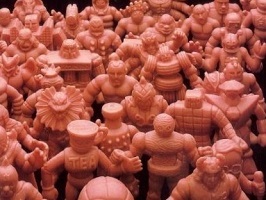 If it wasn’t for ataricraz’s listing of over 200 single Flesh figures, there would only be a roughly a dozen M.U.S.C.L.E. auctions on eBay. And with those approximately one dozen auctions there are not any auctions that cause most collectors to scream with excitement. However, there is an auction worth highlighting. The auction, M.U.S.C.L.E. toy collection and “Hard Knockin’ Ring”, represents a conundrum that often faces M.U.S.C.L.E. collectors. It is a conundrum that encompasses impulse, fear, excitement, compulsion, and likely any other attribute that can describe a collector. The conundrum is price versus value. 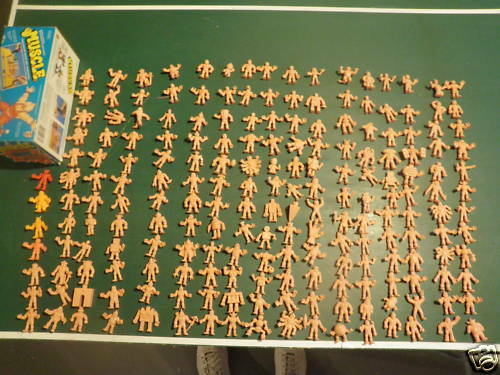 I found this treasure trove of 199 distinct (no doubles)Kinkeshi/M.U.S.C.L.E. toys from the ’80s. 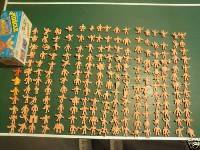 Most (195) of them are the pink variety, which I gather is the ‘original’… Since I came up just short of 200, I’m throwing in their wrestling ring, which I’ve seen selling for exorbitant prices on ebay by itself (seriously, $299! look it up). All items are used, but these toys are pretty resilient, I can’t distinguish them from being brand new, except the ring’s clearly been used (but works fine!). Email the seller with any questions at all. The starting bid has been impacted by another outlandish price, which can currently be seen here and has been mentioned before in Auction Watch #6. More accurately, the U85 graded version was previously mentioned – which was $100 more than the U80 version that is currently listed at $299. Based on the history of selling prices for these pieces, it would be logical to assume that the seller simply stopped listing the U85 version. 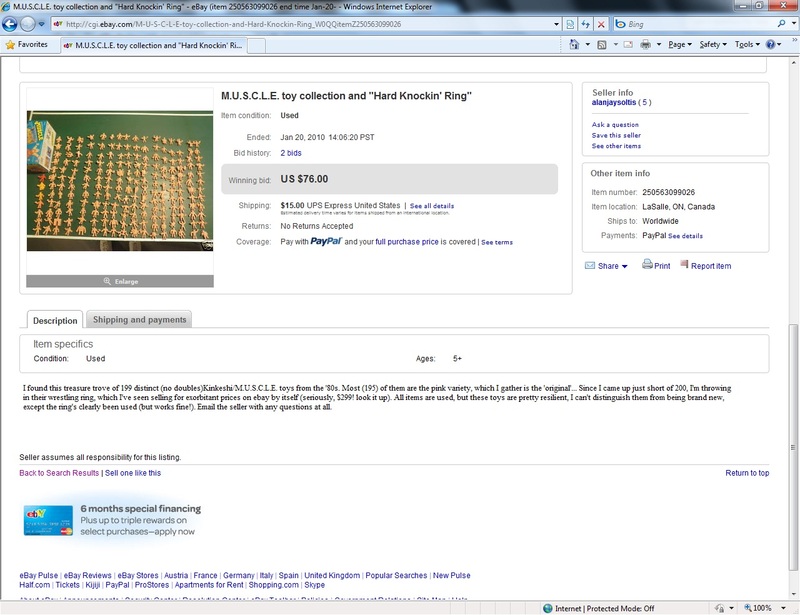 It is possible, although unlikely, that a collector actually purchased the $400 U85 ring. Some M.U.S.C.L.E. 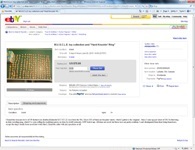 collectors suggest that the sale price of items represent the actual value of the items. The University of M.U.S.C.L.E. and another group of M.U.S.C.L.E. collectors believe that the sale price of items does not represent the actual value. While collectors may not fully agree, it is clear how the topic impacts auctions. As this topic is far too broad to fully cover in an Auction Watch, it will be further explored in the future. This auction shows how prices, not value, can impact the prices that are set for auctions and/or private sales. Nearly 200 Flesh figures might approach $75, however it is certainly not a guaranteed price. The Hard Knockin’ Ring is a positive addition to the auction, but the lack of detailed pictures ultimately hurt the value added by its inclusion. An auction of this caliber would have been better served by starting at a lower price to entice more collectors. 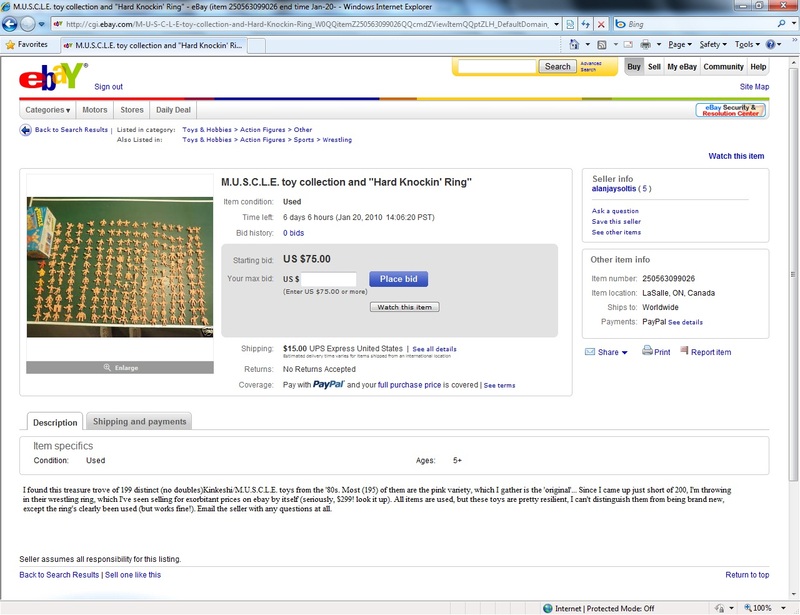 Unfortunately, the seller believes the wrestling ring is a valuable part of the auction. A combination of minimal and bad information left a false impression of an acceptable/normal price. Whether this auctions sells or not, is truly debatable. Ignoring the inclusion of the ring puts the per-figure cost at $0.38. Assuming the ring is worth, at least, $8 it drops the per-figure price to $0.34. A collector that values the ring at more than $8 only continues to decrease the per-figure price. On paper, at roughly thirty cents per-figure, this auction appears to be a good deal. However large lots of figures tend to be fairly volatile with their expected per-figure prices; compare the per-figure prices in Auction Watch #15 and Auction Watch #11. This auction’s final price will be $79.60. Follow-Up: The final price of the auction was $76.00, a difference of $3.60 from the predicted final price. 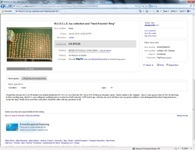 This entry was posted on Thursday, January 14th, 2010 and is filed under Auction Watch, UofM News. You can follow any responses to this entry through RSS 2.0. You can skip to the end and leave a response. Pinging is currently not allowed. hmm it’s got a claw but no SC. announcer guy and 1 meat.